Bright red; acid yellow; leaf green. The colours are bright, almost garish in some of JP Willis’s work, even when off-set against a black or white background. They remind you of lollies; sugar-sweet and reminiscent of fairground colours, childhood holidays and bright sunshine; but with all Willis’s images there is a darker reality lurking. 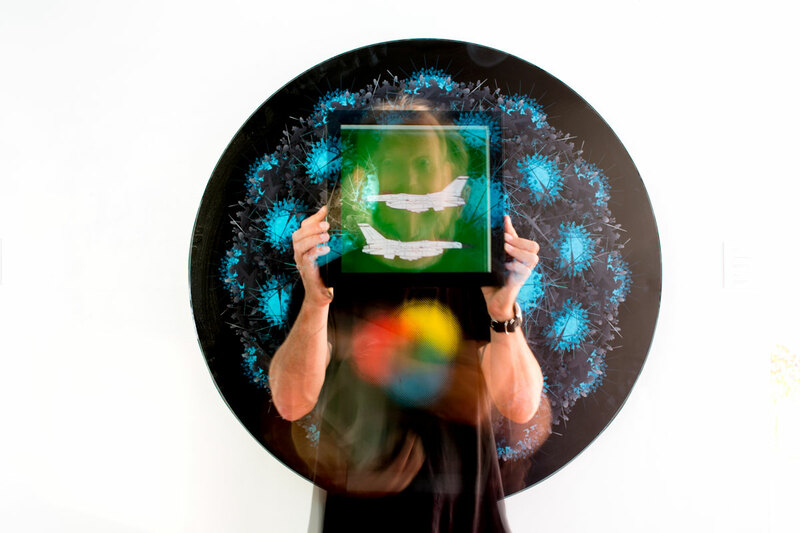 If you look harder at the mandalas of his recent pieces you realise that the repeating shapes aren’t pretty at all: they’re made from machetes, AK47 assault rifles and MIG jet planes. How ironic, then, that these images take the form of the mandala, whose paradigm in the Buddhist path references the end of human suffering, the attainment of enlightenment and the immanence of sanctity in the universe. Willis’s preoccupation is with the nastiness within, and it’s a peculiarly human nastiness. Another body of work, Looking for Love, combines flat, bright pigments with line drawings screen-printed onto glass and layered together in a box frame. Beautiful and exacting, they have titles such as French Kisses, Kissing Games or Bedtime Kiss and show fighter jets carpet-bombing city-scapes, releasing parachuting soldiers or dropping cluster bombs. Willis conjures death out of a blue sky. This contrariness, the sideways look at the world that combines lightness of approach and weighty subject matter runs through all Willis’s work. The images become a modern memento mori; deftly playing off masculine iconography and saturated colour. Green; yellow; red. Birth; life; death.